On January 11, 2017, along with 10 others, Jeremy was consumed by a large avalanche in the Utah backcountry. The information, observations, and accounts that follow are the footsteps of a cautionary tale of what it takes to get out alive when things go as wrong as they possibly can, and then how to deal with the inevitable reality of the cause-and-effect. The thing is…What doesn’t kill you, doesn’t always make you stronger- It just doesn’t kill you. The choices you make during and after the battle are the things that ultimately will make you stronger…or not. You will have to decide. If you’re in SoCal this weekend Nixon is inviting you to stop by at 3 PM when they open the doors of their showroom. Nixon’s offices are located at 701 South Coast Highway, Encinitas, California. For the official invite from Nixon co-founder Chad DiNenna, please follow the jump. It is my pleasure to share our next Social Club event will be Friday February 8th, 3 – 5pm we will open the showroom doors to your family and friends as well as our local community for some quality time with snowboarder Jeremy Jones. 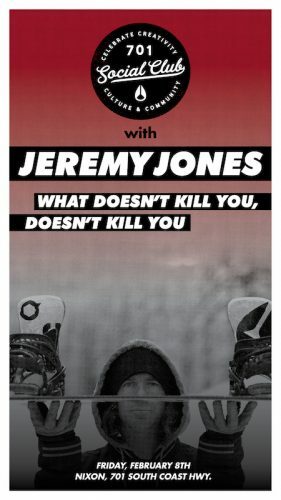 A professional snowboarder for over two decades, Jeremy is known throughout the sport as a pioneer, pillar, and relentless innovator. First carving out a name for himself under the infamous Forum 8 snowboard team, he then moved on to represent some of the best brands in the sport. A longtime collaborator with Nixon, co-creator of the Nixon JibFest, his connection and influence on the sport, its brands and industry are countless. Continuing his assault on the streets and backcountry, he filmed some of the most progressive and dynamic video parts compiled. Jeremy’s accomplishments and accolades in snowboarding are numerous, and some will stand as the benchmark for a long, long time to come. This is a public event, we encourage you to invite your community to enjoy and learn with us. Feel free to share this invite. The 701 Social Club is a bi-monthly showcase of people and ideas that are culturally and otherwise interesting to all of us at Nixon. Our aim is to share and celebrate, with our community, things that deserve our attention. Previous post: Did American Media Just Buy TEN?